Ken has ridden with TRC several times over the last couple of years. Now you can read his incredible story. 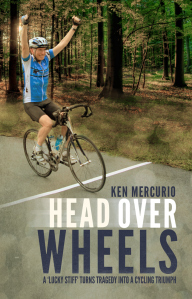 CINCINNATI — Sunbury Press has released Ken Mercurio’s medical memoir Head Over Wheels – A ‘Lucky Stiff’ Turns Tragedy into a Cycling Triumph. The Troy Grade is steep but Dave handles it just fine on his recumbent. Comments Off on Recumbent Madness? Good maps and information is about all you need for a bicycle tour. Now comes an opportunity to help build just such a resource for Washignton State. click through to the Kickstarter page and contreibute a few bucks to get this project published. I trust that you all have been enjoying the fine summer weather. At the Bicycle Alliance of Washington, we are running a Kickstarter campaign to support the development and publication of a Washington State bike touring guide book- Cycling Soujourner. I’ve already kicked down a $75 pledge for the campaign and i strongly encourage you to make a pledge of any amount you can afford. Here is a blog post about the book project written by our Executive Director, Barb Chamberlain. There is also a great educational opportunity coming up next week; an introduction to bike touring at Island Hoppin’ Brewery on Orcas. Martina Brimmer of Swift Industries will be presenting from 7:00-9:00PM on August 15th. Here is a blog post that i wrote about a tour that Tiva and I took in the San Juans and Gulf Islands last summer. Please feel free to circulate to other interested folks. Let me know if you have any questions about these items or any other bike-related stuff. I use my mobile phone’s GPS to track my bike rides which I then upload to Strava. Unlike purpose built GPS devices, phone GPS can be wildly inaccurate, especially in the steep valleys I often ride through in the Santa Cruz Mountains. The results uploaded to Strava can look like this. via Cyclelicious » Strava SNAP: Fix GPS data to track roads. It is a surprise to see the rusty girl’s bike embedded in a tree about six feet off the ground. I searched around for it this summer on a bike ride over on Vashon, and finally found it in some woods on the northeast corner of 99th Avenue SW and SW 204th Street (see map). via That old bicycle lodged in a tree on Vashon Island makes national headlines » Biking Bis. Yoga for Cyclists part 7: Knees | road.cc | Road cycling news, Bike reviews, Commuting, Leisure riding, Sportives and more. The highly anticipated first of three auctions of vintage bicycles and memorabilia from a recently closed New York-based museum earlier this month brought in a jaw-dropping half-million dollars, about 150% of what the auctioneers predicted. via Vintage bicycle collection scores high bids at 1st auction » Biking Bis. I’ve tried every trick imaginable to keep my feet warm during cold-weather rides — larger shoes with 2 pairs of socks, battery-powered socks, spray antiperspirant to reduce sweating, plastic bags to cut wind. But no luck. My frozen feet are always the limiting factor in winter riding. Any tips? — Judy D.
via Tips for Keeping Feet Warm | Road Bike Rider. Climate Change? and the bicycle? This fellow combined an interest in both to produce this four video series. He biked from California to Florida, interviewing people about environmental efforts along the way and then produced this four video series. Cyclicious introduces it, but you might go directly to The Project Southern Tier website to view the videos. Cyclelicious » Project Southern Tier. He set off from the Hercules Inlet on the coast of Antarctica on Dec. 20 and hopes to arrive at the South Pole on Jan. 12.
via American explorer attempts bicycle journey to the South Pole » Biking Bis.